Presented in iconic Black over Gold, this US specification Carrera Targa is a great survivor car with an unbroken documentation chain, and showing just 62K original miles. This specific car (9115410024) was featured in Henry Rasmussen’s “Porsches For The Road – The Survivors Series,” with a two full page spreads, as well as a large photo in the table of contents. A copy of the book is of course included with the sale. With only 184 of these Carrera Targas produced for the US market in 1975, this car is quite rare, furthermore with the color combination – understood to be one of just 36. Originally optioned and delivered with Koni shocks, gold Carrera scripts and gold Fuchs wheels, Comfort Group 2, and black paint per the original window sticker. 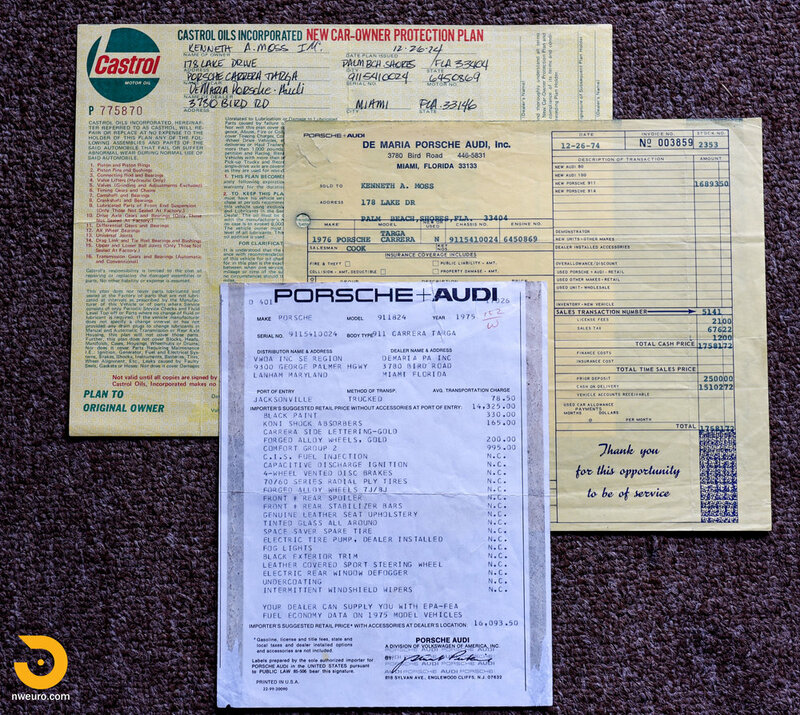 With wonderful documentation beginning in December of 1974 (original sales order and window sticker), every record, invoice, and ownership change is accounted for up through the present day. Sold new at De Maria Porsche Audi in Miami, Florida, the car spent many years in the Southeast region, Oklahoma, and in the Northwest since 2005. The file is full of wonderful letters from one owner to the next talking about the car, the care, and their enjoyment of it. Sporting original finish Fuchs gold 15” wheels, and Bridgestone 215/60-15 (rear) and 195/65-15 (front) tires, the car looks striking in person with the matching Carrera gold script. Regarding the exterior condition of the car, overall the car presents sharply in person. The rear of car (engine lid, both rear quarters and blending into the doors) was painted in 2011 after an unfortunate incident where the car rolled down a driveway and into a closed garage door. Rear glass was also replaced with a 1977 piece. Front bumper painted in preparation for sale due to chips and scratches. The front fenders, cowl, and hood appear to still be original paint, as well as all interior painted surfaces (trunk, door jambs, etc.). H-1 headlights are fitted, originals are included with sale. Original Targa top material on exterior and interior is in excellent original condition. The interior is largely original, featuring factory sport seats in black leather. Carpet is original except for the back of the rear seats, and the floor mats. Non-original detail items include a modern stereo head unit and speakers in the doors, metal door release handles, and shift knob. The car runs, shifts, and drives as you’d expect for just 62K original miles. 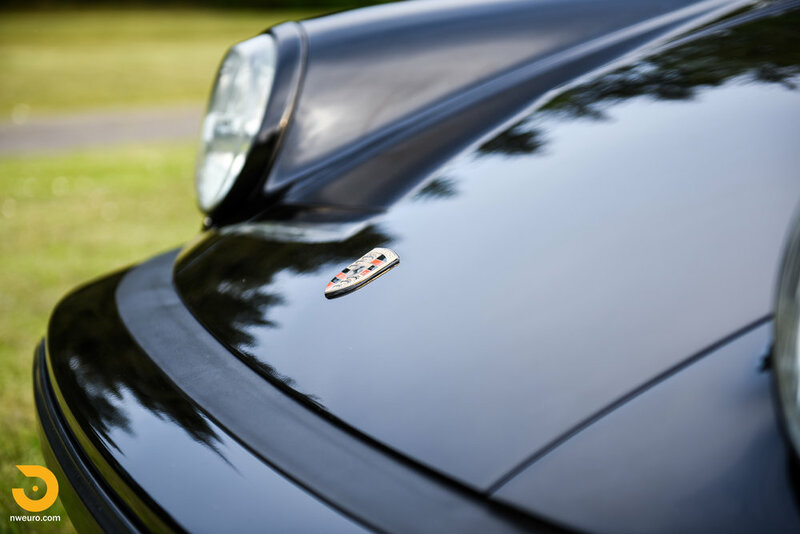 Mechanically serviced at well-known Porsche marque specialists across the country over the years, the car currently does not have any mechanical needs. The York A/C was fitted from new, and currently works and blows cool air. Upgraded Bilstein shocks in 2014. The most recent service was at 62,300 miles and included an oil change, new battery, rebuilt alternator, brake fluid flush, and new front trunk lid shocks. Currently fitted with an M&K sport muffler, the original muffler is included as well. This Carrera Targa is offered with the original owner’s manual, warranty booklet, key code card, original factory key (broken, but included), original tool set and blue jack, window sticker, and complete documentation file from new. 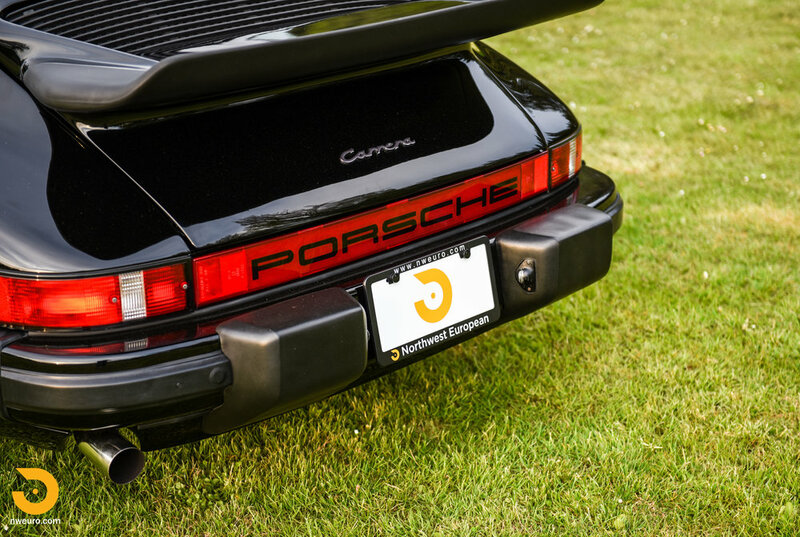 A wonderful and iconic Porsche Carrera Targa looking for the next caretaker and adventure. Please call Jason at 206-355-7727 for more information on this Porsche Carrera Targa for sale.